Finally, after a quarter century of warnings by climate scientists, an agreement to curb greenhouse gas emissions has been signed by nearly 200 world leaders. 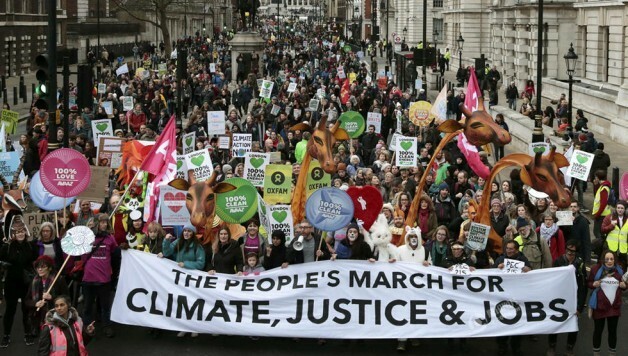 Environmental activists worldwide can take encouragement – their relentless efforts played a major role in forcing, for the first time, acknowledgement by all world leaders of the catastrophic risks posed by global warming and the political consequences if they continued to ignore it. The agreement reached recognizes the need to stay below 2 degrees Celsius, with aspiration to keep warming below 1.5 degrees. But, the voluntarily set targets for reductions in greenhouse gas emissions are non-binding and don’t kick in until 2020. If all of the targets are hit – which has never happened before – global temperatures will still rise by 3.5 degrees Celsius, two degrees more than scientists say is safe. It also creates $100 billion per year fund to assist developing countries in mitigating current climate change impacts and developing renewable energy infrastructure. The response from India, however – that they will continue their plans to double down on coal – suggests $100 billion a year is not nearly enough to stop poor countries from using fossil fuels. Climate talks in Copenhagen 2009 was seen as the best chance we had to forge a global agreement, yet it ended without any agreement, only a blame game between participating countries. Since then, environmental activism has dramatically increased. Last year saw the largest ever climate change demonstration in New York City – 400,000 people out for the People’s Climate March. While similar protests were planned this year, the French government reacted to the recent terrorist attacks by banning marches for the duration of the talks. Nonetheless, 15,000 defied the ban on the last day of talks in Paris and over 750,000 demonstrated for action in cities worldwide (socialistworld.net). According to Oxfam, “the only beneficiaries of inadequate climate action in Paris and beyond are a much smaller elite with vested interests in the continuation of a high carbon and deeply unequal global economy.” Oil companies are among the largest and most profitable corporations in the world and contribute heavily to political campaigns. Those politicians, bought by big oil, send their negotiators to these climate summits where they fight each other to protect the interests of their paymasters. Big business and the super-rich profit from the fossil fuel industry while the poor overwhelmingly pay the price – it is mostly women, indigenous peoples, and people of color who are on the front lines of the effects of climate change. The crisis is real and immediate. The extreme flooding occurring as widely as from Oregon to India during the climate summit was a stark reminder of this. To prevent climate catastrophe, working people must unite and fight to limit the power of the energy industry. Ultimately, this means taking the energy industry out of the hands of those who run it for profit and ignore the environmental consequences. In the hands of the working class, the tools and resources of the fossil-fuel corporations can be used to efficiently develop and deploy renewable energy technology on a mass scale, ensuring a just transition for all workers and an ecologically sustainable future for all. Next articleVenezuela Elections: Who Won and Who Lost?